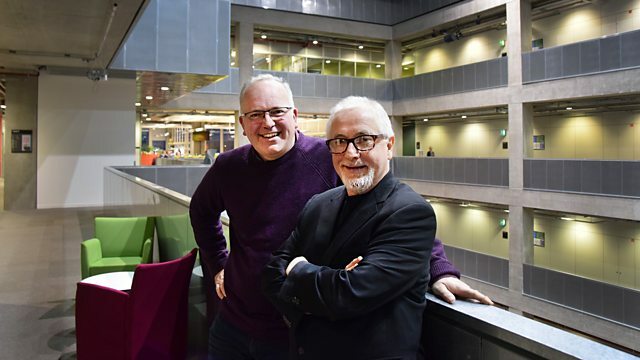 Jamie MacDougall’s special guest this week is the multi-award winning film composer Patrick Doyle. He chat’s to Jamie about his very successful career including his many collaborations with Sir Kenneth Branagh and working with Placido Domingo. Ravel: The Complete Solo Piano Music. Orchestra: Bamberg Symphony Orchestra. Conductor: Jakub Hrůša. Brahms No 4, DvorakNo 9. Orchestra: London Symphony Orchestra. Conductor: James Shearman. Orchestra: City of Birmingham Symphony Orchestra. Choir: The Stephen Hill Singers. Conductor: Sir Simon Rattle. Singer: Plácido Domingo. Conductor: Robert Ziegler. Orchestra: Unknown. Brave (Original Motion Picture Soundtrack). Cinderella (Original Motion Picture Soundtrack). Singer: Jonas Kaufmann. Orchestra: Prague Philharmonic Orchestra. Conductor: Marco Armiliato. Szymanowski: The Complete Music For Violin And Piano. Berlioz: Les nuits d'ete: SCO/Ticciati. Performer: Antônio Meneses. Performer: Maria João Pires. The Wigmore Hall Recital: Schubert; Brahms; Mendelssohn. Performer: Paul Lewis. Singer: Mark Padmore. Schubert Winterreise: Mark Padmore - Paul Lewis. Delius / Elgar - String Quartets. Performer: Emanuel Ax. Orchestra: Philharmonia. Conductor: Esa‐Pekka Salonen. Schoenberg/Liszt: Piano Concertos: Emanuel Ax/Philharmonia/Esa-Pekka Salonen.